With the fireworks, picnics and barbecue food, the Fourth of July is a favorite holiday of young and old alike. Unfortunately, the very aspects of Independence Day that make it such a beloved holiday can also make it dangerous – if you don’t follow proper safety protocol. With the following summer safety tips, you can ensure your children remain protected and enjoy the celebrations this Tuesday. Any good Fourth of July barbeque requires the essentials: burgers, chicken and grilled veggies. Make sure your children are secured in the shopping cart when you stock up. If you visit the grocery store with an infant, look for carts equipped with Safe-Dock, which is designed to securely contain your infant carrier – and leaves room in the cart for all your goodies! If your children are a bit older, remember to strap them in or look for Shop-Along carts, which can accommodate multiple children. Fire departments are called to douse home grill fires each year, so it’s important to practice grill safety: never grill indoors, use long-handed tools to flip your burgers and chicken, and keep children and pets away from the grill. Consider using chalk to indicate a “grill safety zone” so children know exactly where to stand as they watch you cook. Keep matches and lighters safely out of reach, and teach your children how to “stop, drop and roll” so they’re prepared for any dangerous situations. According to Parents, more than 30 percent of the 5,200 injuries from fireworks each year happen to children. These injuries most often result from sparklers or homemade firework displays, and include burns and finger amputations. To stay safe, don’t set off fireworks in your background and instead opt for public firework displays. Always stay at least 500 feet away from the show and in designated viewing areas, and be sure to prep your child beforehand. 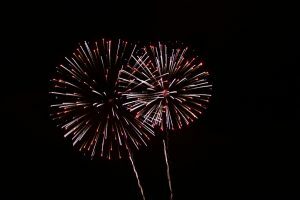 While they may like the idea of fireworks, the loud noises and large crowds might upset them. If you bring your baby to the show, consider keeping them in a carrier and providing headphones to muffle loud noises. By following these guidelines, you’ll ensure a safe – and fun – Fourth of July celebration for your family. Happy Independence Day!